A £50 discount for all clinical practice members at our highly acclaimed annual conference. Posters and a sticker for your waiting room. Free email advice service from RWAF veterinary expert advisor, Richard Saunders BSc BVSc CBiol MSB CertZooMed DZooMed (Mammalian) MRCVS. Quarterly update from Richard Saunders keeping your practice up to date with all the latest developments in rabbit health and medicine. Quarterly e-newsletter, that you can send to your clients. Opportunity to apply for inclusion in the RWAF rabbit friendly vet list – see below. All of this for only £45 a year. 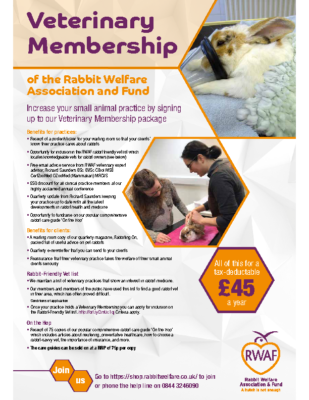 One of the biggest reasons for joining is that all up to date RWAF practice members can apply to be list on our published ‘Rabbit Friendly Vet List’. This list is available on our website to anyone that is looking for a rabbit friendly vet, and is one of the most common enquiries that we get via our helpline. Any RWAF veterinary practice members can complete an application form which will be reviewed by our veterinary expert advisor, Richard Saunders. Richard will assess each application and if your practice is rabbit friendly you will be given a Silver or Gold status. You will be given the relevant logo and certificate to use for your own marketing purposes and will be included on our published list, which is updated every 2-3 weeks. Your membership must remain up to date to remain on the list, and you must inform us of any change of circumstances. You will need to reapply every 12 months so we can ensure we have the most up to date information.